Part of the Deo Collection this Round Italian Dining Table shown in one of our most popular size table in 79″. Large table top features the Pompei black line inlay on burled walnut wood in walnut finish and the unmistakable tulip style based will add a distinctive and stylish look to any dining room. Seating for up to 12 in the larger tables sizes. Please click the ADD TO QUOTE to request a quote. 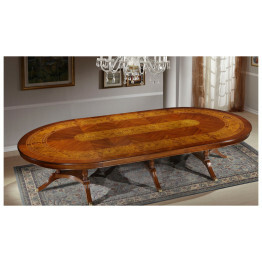 Part of the Migliori Collection, this formal Italian Dining Room Table is shown in a 98″ size with, ash-briar and a cherry band with gold trim on pedestals. 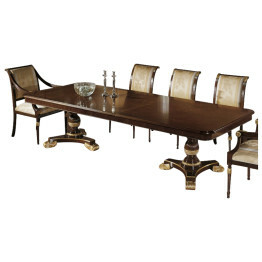 Exquisitely handcrafted formal Italian dining table. Made 100%in Italy by skilled Italian craftsmen with generations of furniture building experience. 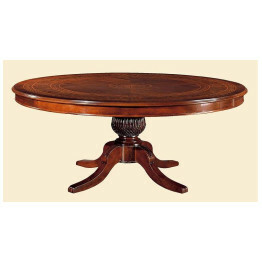 Our dining room tables are made from carefully selected hardwoods with walnut or mahogany tops. They are hand finished, and each Italian dining table is unique. Available in sizes 98″, 118″, 138″, 158″, 178″, 198″ and your choice of one or two 20″ extensions. With that much space, you can seat up to 22 people or more! Select from a plain walnut top, ash briar (burled walnut) or feathered mahogany. 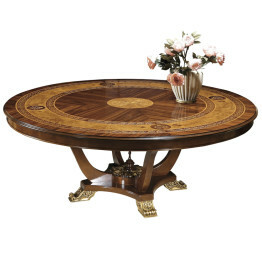 You can also choose to have the top intricately inlaid or with a cherry or walnut border. 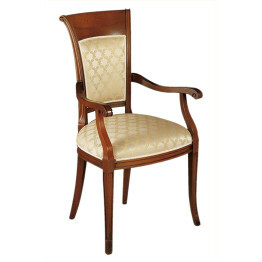 These Italian side chairs are made 100% in Italy and are hand finished. The wide seat design on this dining chair offers comfort and durability while the hand carvings and gold decoration display elegance. You may customize these Italian chairs with your choice of finish and fabric. 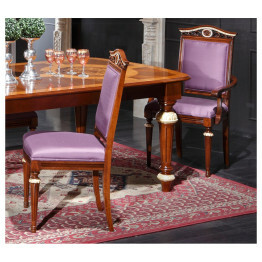 This classic Italian style side can be paired with the matching arm chair. 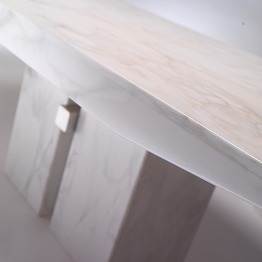 This beautiful modern marble Italian dining table by designer Giorgio Soressi is produced by Valdera Export. Available in five different types of Italian marble; White Carrara marble, Michelangelo White (as shown), Coral Beige, Marquinia Black, and Port Laurent. 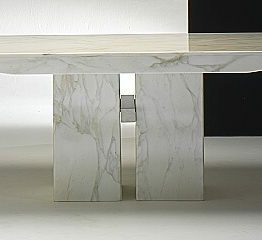 Table is shown in Michelangelo White marble with two bases and central steel element. 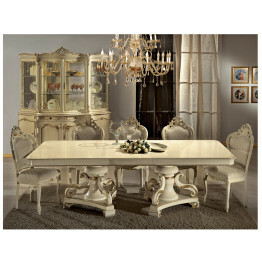 Glam and Chic Italian Dining Set. 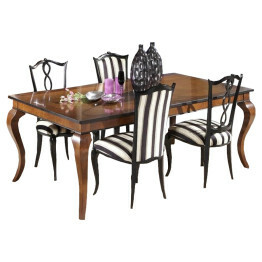 This dining set is part of the Glam and Chic design and has been one of our most popular Dining room sets. This collection was created by Giada and Jenny the third generation at Guerra Vanni. They have a passion for design and bring this classic style to a modern-day look and feel. The set is shown with the molly chair in black lacquer and the table is in walnut finish, but can be finished in a variety of finishes depending ho much glam and how much chic you are looking for. 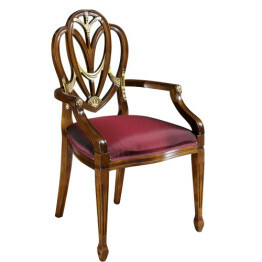 Classic Italian solid wood dining chair. 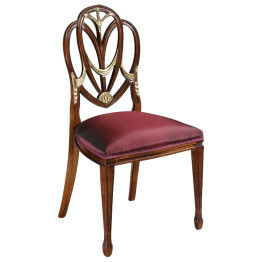 Classic Italian solid wood dining chair. This beautiful arm chair features a classic Italian design and is show with gold accents. The Abazato Italian Dining Table is Made 100% in Italy by skilled Italian craftsmen with generations of technique and furniture building experience. Rectangular dining table featured in this picture is made of carefully selected hardwoods and your choice of a custom hand finished color. Available in various sizes from 98″ all the way up to 198″. Choose from a plain walnut top, ash briar (burled walnut) or feathered mahogany. 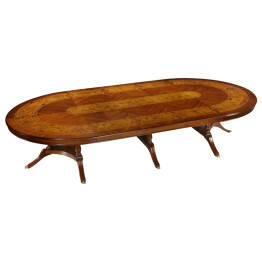 You can also choose to have the top inlaid or with a cherry or walnut border. 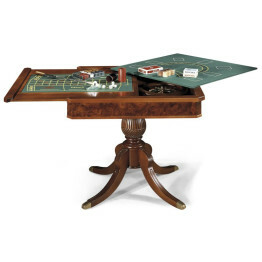 Visit our table inlays and wood finishes tab to view all the table top options available. 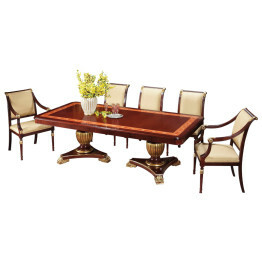 The Abazato rectangular table is shown in size 98″(L) in mahogany finish with gold trim on the pedestals. Classic dining chair shown is the GV841s Side Chair and the 841p Armchair. 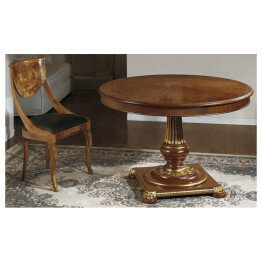 Classic Italian round table inlaid with custom design in walnut finish with gold decoration. 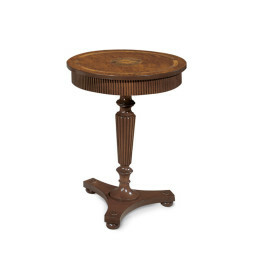 Unveiled at the international furniture fair in Milan, this elegantly detailed small round table is perfect for a small family or a beautiful foyer piece that will leave all of your guests stunned. 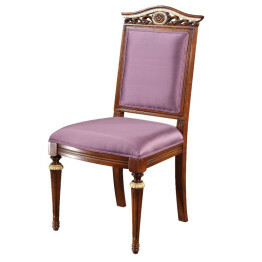 Classic dining room chair shown is the GV784s with gold decoration. Available in walnut, cherry, or mahogany finish. 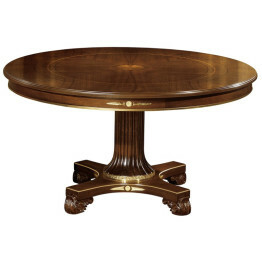 The Ventuno 79″ Round Italian Dining Table shown with the special Ventuno inlay and hand finished in a warm walnut finish with gold decoration on the intricate pedestal feet. 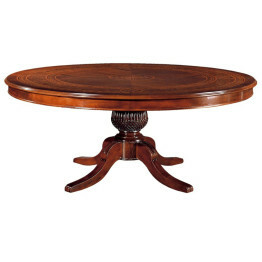 This table top measures 79″ round which makes it perfect for a large formal dining room and can fit up to 10 chairs! 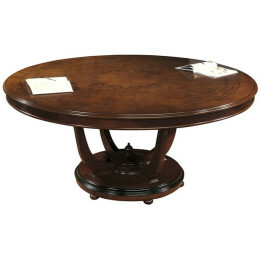 Add a stunning lazy susan to increase the elegance and function to your large round dining table. Pictured with the GV708s Dining Side Chair. Add a one of a kind piece to your home that will last you and your family generations. Our superior Italian furniture is made 100% in Italy, and every piece is custom built to your taste. Italybyweb.com is a direct importer from Italy, and our savings are passed on to you. If you are ordering a multi-piece set, ask us for the discounts available! 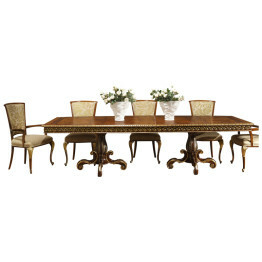 Italian Dining Table with special Ventuno Inlay. 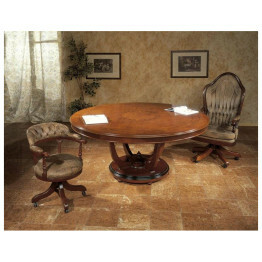 This gorgeous expandable round dining table shown in the popular 83″ size includes two 24″ extensions. The Leonardo Collection 158” Shaped Dining Table with “Mother of Pearl” is handcrafted in Italy using centuries-old techniques handed down through generations of artisans. This table has a gorgeous “Mother of Pearl” inlay that is set inside an olive ash burl. 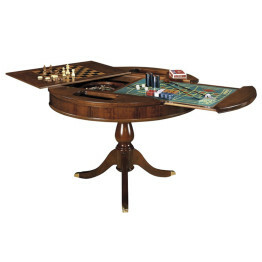 The outside border of the table has a mahogany and maple inlay. 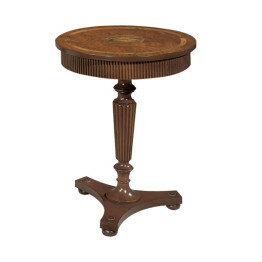 This table has 3 pedestal bases for extra support. 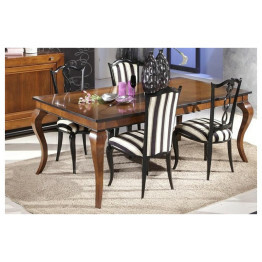 158″ Dining Table seats up to 16 people. 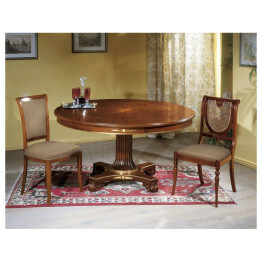 Part of the Regale Dining Collection this Round Italian dining table is shown in a standard 59″ round size. 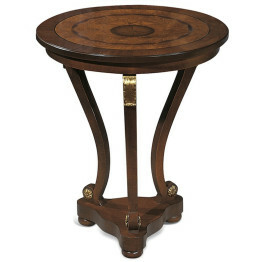 Impress your guests with the subtle yet elegant wood inlay of this round dining table, graced as well by carved embellishments and gold accents. 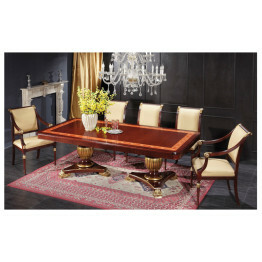 Italian table is shown in a walnut finish with ash briar top, inlay and gold decoration. Available in walnut, dark walnut cherry, or mahogany finish. 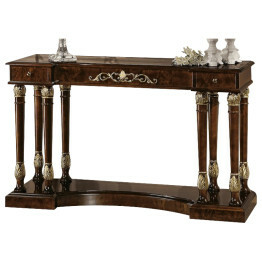 Classic Italian console handcrafted in Italy. This console is shown with 8 columns, 2 drawers and a beautiful gold decoration. 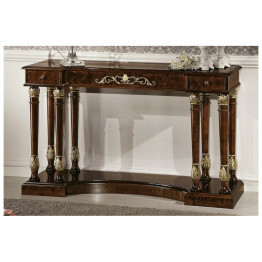 Console tables have many uses in your home and can be a great accent piece in a foyer or a hallway. This console table comes with a gold leafed mirror. Available with or without gold decoration. Part of the Raffaello Collection, this handcrafted Italian dining chair is made 100% in Italy by skilled Italian craftsmen with generations of furniture building experience. 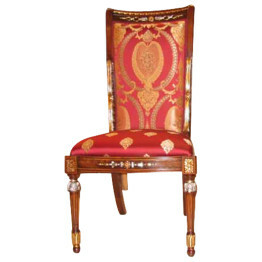 This classic Italian solid wood dining chair has been elegantly carved & gold-accented back of the chair and front legs. Crafted 100% in Italy this classic armchair is available in your choice of walnut, cherry, or mahogany finish. Part of the Raffaello Collection, this handcrafted Italian dining chair is made 100% in Italy by skilled Italian craftsmen with generations of furniture building experience. 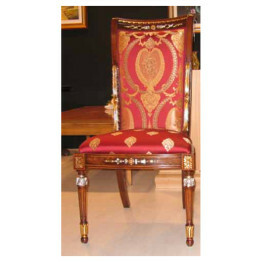 This classic Italian solid wood dining chair has been elegantly carved & gold-accented back and front legs. Crafted 100% in Italy this classic armchair is available in your choice of walnut, cherry, or mahogany finish. 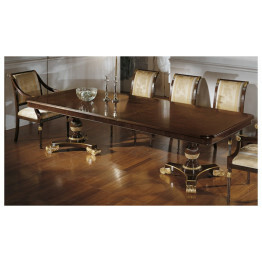 The Francesco Dining Collection 98″ Lacquered Table has been one of our more popular collections. The 98″ table can be ordered with two additional extensions of 20″ each extending this table to 138″. When this table is fully extended, it would allow seating for 14 people. 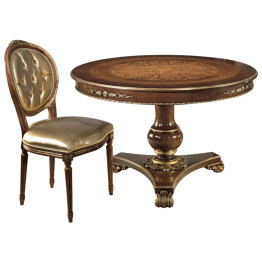 The elegant hand carved details on the pedestal bases and gold leafing gives this table a look not found anywhere else. 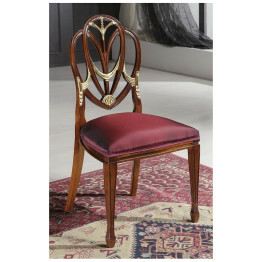 Classic Italian solid wood dining room chair. 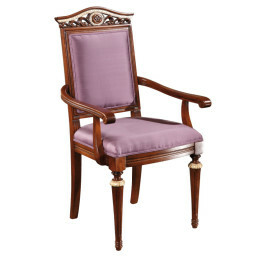 Stately armchair made of solid wood. Available in your choice of walnut, cherry, or mahogany finish. Also available in leather. This beautiful Italian armchair can be paired with matching side chair. Leather available $50.00 per chair. 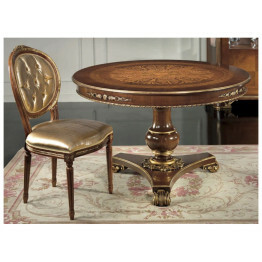 lassic one pedestal round Italian dining table shown in 47″ on briar with black line inlay and gold decoration in a glowing cherry finish. The fusion of the chic base from the GV1232 rectangular table and a refined round table top gives this table a look and feel that will enhance any dining room. The all square base features a design that is unparalleled in sturdiness and grandeur. Combine that construction with the high caliber of workmanship and fine Italian elegance this round table will be timeless piece in your home. If you have any questions or need help navigating through the site please call our toll free number 877-266-2536 and speak with one of the experienced staff at ItalyByWeb.com . 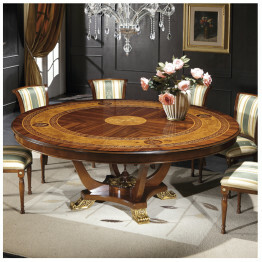 Classic Italian round dining table shown in the popular 79″ size table with the intricate Ventuno inlay. 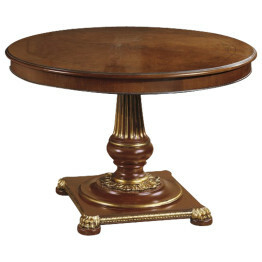 The stylish pedestal makes this round table have a true Italian sophistication and is sure to bring a touch of elegance to any dining room. 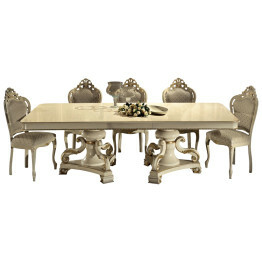 To make this Italian dining table more formal add hand painted gold accents. Every piece in our fine Italian collection is custom built and constructed to last generations. Quality and our wholesale pricing direct from Italy make these fine Italian tables functional and affordable.